“I have had a few sessions with Sahra and still look forward to having more in near future. 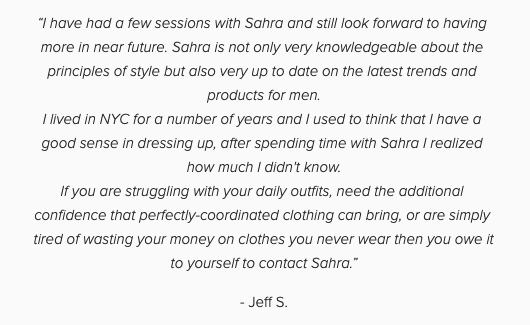 Sahra is not only very knowledgeable about the principles of style but also very up to date on the latest trends and products for men. I lived in NYC for a number of years and I used to think that I have a good sense in dressing up, after spending time with Sahra I realized how much I didn't know. "I had so much fun and the service was amazing! This would be a great experience for a girls trip to D.C. or a bachelorette party. Highly recommend!" 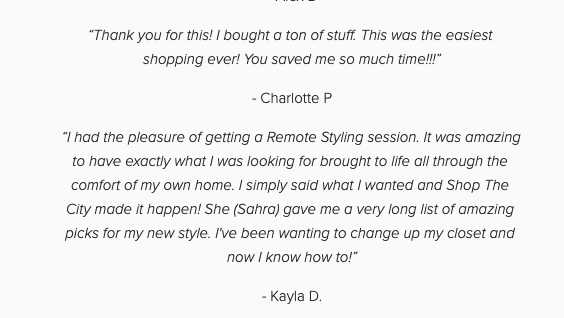 "I’ve known Sahra (the owner) for years. 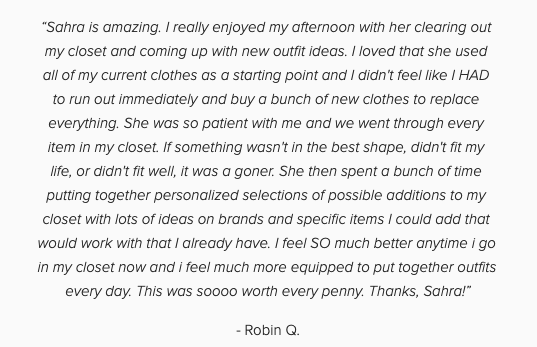 She has a great eye for style and truly listens to personal style preferences and can find great items on a budget!" "Really great shopping experience! It was really fun to have a curated experience - I learned about so many stores I never knew about previously. The champagne during the tour was a nice touch!"